You Wanted It All. Here It Is. 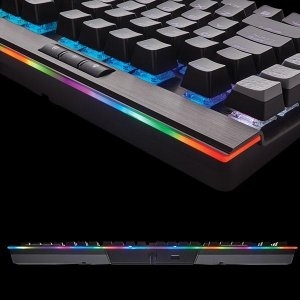 CORSAIR K95 RGB PLATINUM features Cherry MX Speedkey switchess backed by a lightweight aluminum frame. 8MB profile storage with hardware macro and lighting playback enable profile access independent of external software. Utilize the 19-zone LightEdge to add to dramatic animations and effects. 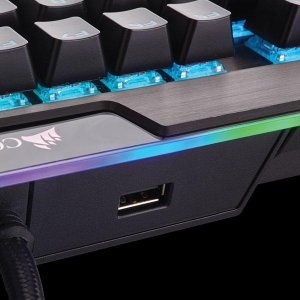 Take advantage of the 6 programmable G-keys for in-game macros.100% anti-ghosting with full key rollover on USB ensures every keystroke translates directly into accurate gameplay. USB pass-through port provides convenient access to an additional USB port for your mouse or headset. Dedicated volume and multimedia controls allow you to adjust your audio without interrupting your game. 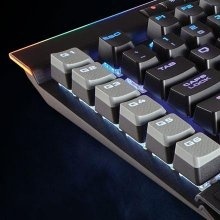 K95 PLATINUM takes CORSAIR performance to another level. 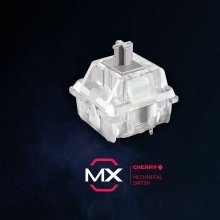 Unleash unreal performance with Cherry MX mechanical switches. 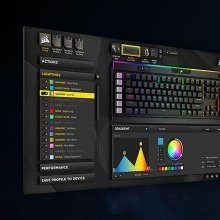 Store and playback complex macros and lighting effects to any key. Battle on a keyboard that can withstand a lifetime of use. 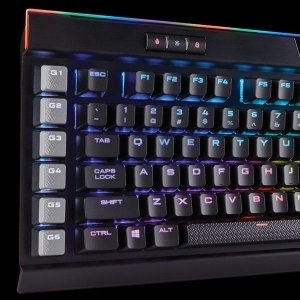 RGB MX Speed, Ultra Fast Actuation, 1.2mm. 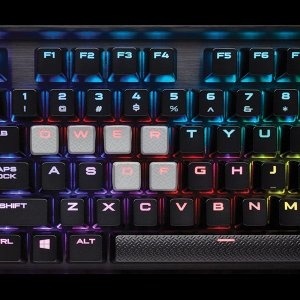 Assign complex in-game macros to any of the 6 dedicated macro keys. Textured so you can easily find them, contoured so you don’t accidentally press them. 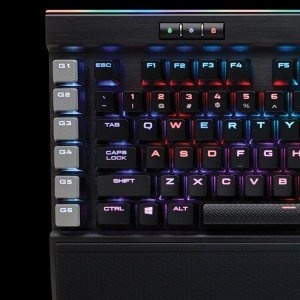 K95 PLATINUM launches the CORSAIR best-in-class keyboards into another dimension of customization. 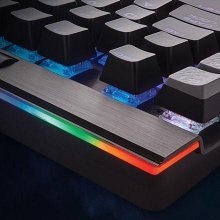 Our iconic aircraft aluminum construction now features innovative LightEdge technology, so you can light up your mission control in spectacular full RGB. K95 PLATINUM is also great on the road. Take your CUE profiles on the go with 8MB on-board storage. This means more time getting your head in the game, and less time setting up. Built to withstand a lifetime of gaming. 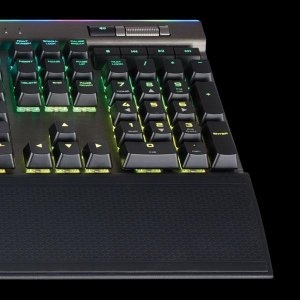 Lightweight and rugged durability, necessary for a keyboard that’s going to see a lot of action. Allow access to up to three stored profiles on the go, completely independent of external software. Deliver dynamic and vibrant lighting effects with virtually unlimited customization. 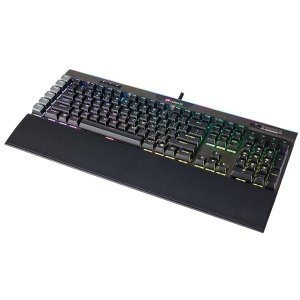 Unleash blistering speed with the durability of gold contact Cherry MX mechanical keyswitches. Ensure your commands and simultaneous keystrokes always register the way you intend. The comfort to enhance your gameplay during marathon gaming sessions. Choose between two different surfaces for optimal comfort. We provide same day delivery services for our top selling products. We may, subject to our discretion and policies, allow returns and exchanges. Endless Passion carries a wide range of products from all of the leading manufacturers, customers are provided with unrivalled choice, competitive low prices, and a highly knowledgeable sales team to give any advice needed for peace of mind.